The photo was taken on Thursday, August 22, just north of the intersection of U.S. 395 and Sonora Pass Road while my partner and I were driving south from Lake Tahoe to Mammoth Lakes. It was very smokey in Tahoe but still sunny over 395 -- smoke from the Rim Fire was mostly blowing north but very visible in the east. We had seen the smoke cloud before entering Walker Canyon and this is what it looked like after emerging from the canyon. We pulled over and I whipped out the camera while the sun was still peaking through the clouds. I didn't push the processing much on this photo -- it really did look cray-cray out with the orange and purplish light reflecting on the Little Walker River. The photo was taken with my Nikon D5100 and Nikon DX 10-24 wide angle lens. It was processed in Lightroom using VSCO slide film presets. Check out more of my work on my newly-redesigned SmugMug site. If you're interested in joining SmugMug, click here for a $5 discount on membership. Prints and licensing are available for the above photo through SmugMug; my prices are very modest. Follow me on Twitter or friend me on Facebook. 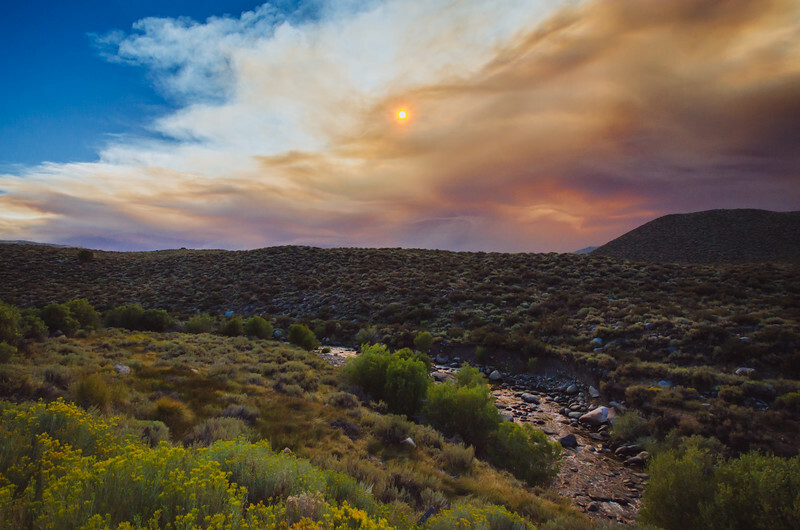 Related post: smoke from the Windy Peak fire over 395.